You Must See Tutankhamun and his Treasures at @SilverstarZA! When I heard the TUTANKHAMUN – His Tomb and His Treasures exhibition was coming to South Africa I was very excited and determined to see it while it was here, and then Tsogo Sun’s newly revamped Silverstar Casino invited my Glugster and I to the opening evening! It was a wonderful event with gold covered “statues” welcoming us inside and gold-rimmed bubbly glasses, and delicious food and a pyramid of gold-wrapped chocolates! My Glugster collected our audio guides but we didn’t know about the earphones so we walked around looking like we were on the phone all night. The guides are included in your ticket price and you can hang it around your neck, and you can’t see the exhibition without one. Be sure to ask for a pair of earphones when you get your guide though – although I think you should be able to plug in your regular phone earbuds too (which neither of us had with us last night 😀 ). It also makes it a lot easier to take pictures if you have both hands free. The first thirty-odd minutes of the exhibition is limited to 60 people, and then you move into the exhibit where you can spend as much time as you like, but it will probably take you about 90 minutes to go through it. Each exhibit is numbered so you punch in the number on your guide to listen to the details, and its available in a kids’ version as well, and I would love to know what was on it! The “adult” audio guide has a LOT of information and my Glugs and I actually skipped a few of those and just read the plaques on the display items. It was really comical standing in front of a display and seeing both of us reacting to what we were listening to on separate devices! I also think it will be interesting for children – Tut became Pharoah at just 8 years old and he was only 18 when he died. And the sheer volume of gold statues and treasures that were entombed with him are quite marvelous. You can’t actually touch anything but its not all barricaded behind thick glass so you can actually get quite close to the pieces. Where Were You When That Song Was Playing? You Must See @MixtapeSA! 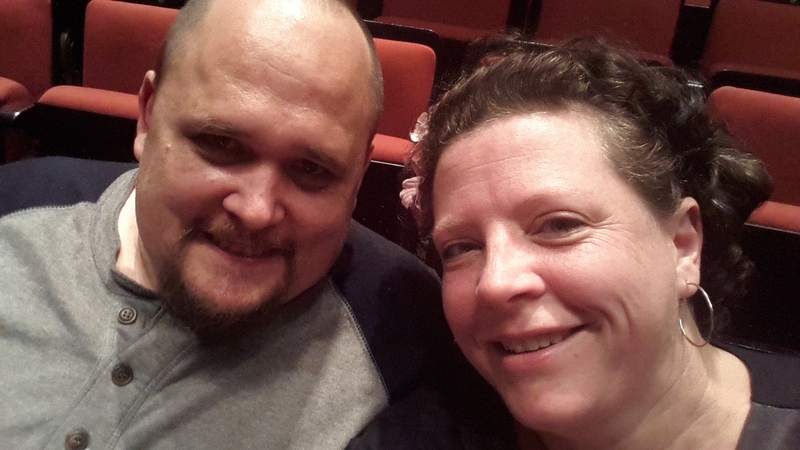 All dressed up for Theatre on the Square! I was given a mix tape once… It was an awesome selection of metal and I loved it. I wanted to play it all the time but old fashioned tapes didn’t last very long, so I had to be careful with it. And then my sister recorded Destiny’s Child or some such over it! Can you believe it!? Last Thursday we got to see Mix Tape at Theatre on the Square and I loved that too! When we arrived we were greeted with some glorious treats! Strawberry daiquiris, pina coladas, popcorn, and a table full of sweets -Toffees, pixie sticks, lollipops, sweethearts, eclairs – it was awesome! This is my kind of theatre experience! The show tells a wonderful story of friends brought together by music, and the relationships they form with each other. I had a lump in my throat on more than one occasion too, so you may want to take some tissues along with you. From the website: Mix Tape is a heart-warming musical comedy about three unlikely friends and the mix tapes that inspired young love, jealousy, angst and embarrassing hairstyles. For a fabulous, funny musical evening with a difference, tickets can be booked by calling Strictly Tickets on 082 553 5901 or Online via Strictly Tickets: www.strictlytickets.com or via the theatre’s box office on 011 883 8606. Tickets are R140 and there are special discounts for students, seniors and group booking arrangement can be made. Enquire about the HARD ROCK CAFÉ dinner/show special on the Nelson Mandela Square to get into the swing of things! if I sneak in at the stage door maybe I can have a private encore…? Last week I got to have a Girlfriends’ Getaway with Ster Kinekor thanks to the ever fabulous Nocturnal Wenchy! We were joined by several social media users of the female persuasion including Jenty, and it was really cool to be able to catch up a little. Girlfriends’ Getaway is for girls only. No guys allowed. So if your man is completely anti-anything resembling a chick flick, grab a gal pal or two and do the Girlfriends’ Getaway. 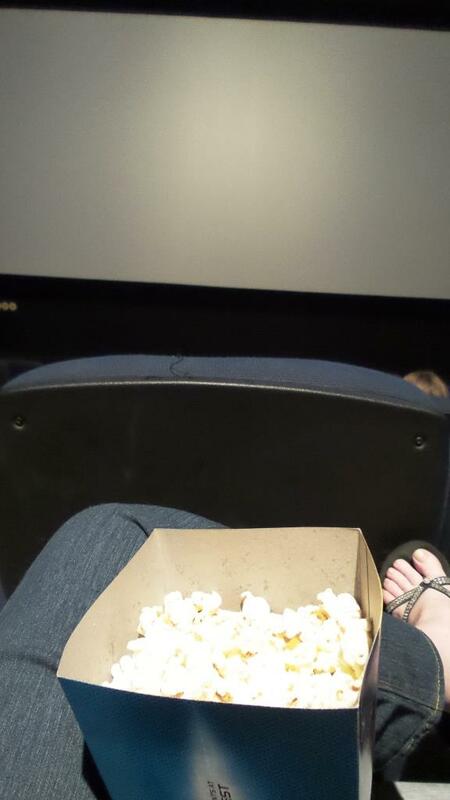 So here’s me seated with my popcorn, which – true to form for me – I successfully spilled as I sat down. Every time. The movie we got to see – Begin Again – actually surprised me, in a good way. A chance encounter between a disgraced music-business executive and a young singer-songwriter new to Manhattan turns into a promising collaboration between the two talents. I was quite blown away by the sound track for one thing, and I will definitely be acquiring it for myself as soon as I can. There was love, and lots of music, and some laughs, and even though the end kinda felt like they’d run out of time and they had to say a whole lot very quickly, I would absolutely recommend seeing it. The next Girlfriends’ Getaway is on 8 October if you feel like a bit of a girls-only night: “Gone Girl“. Ooh, and, as an added bonus, my Glugster got to go and see a movie while I was having a girls’ night out thanks to movie ticket vouchers from Ster Kinekor! As I don’t drive at night my sweetheart husband usually takes me to this kind of function, and he then has to go home and wait till its time to pick me up and this time he didn’t have to! 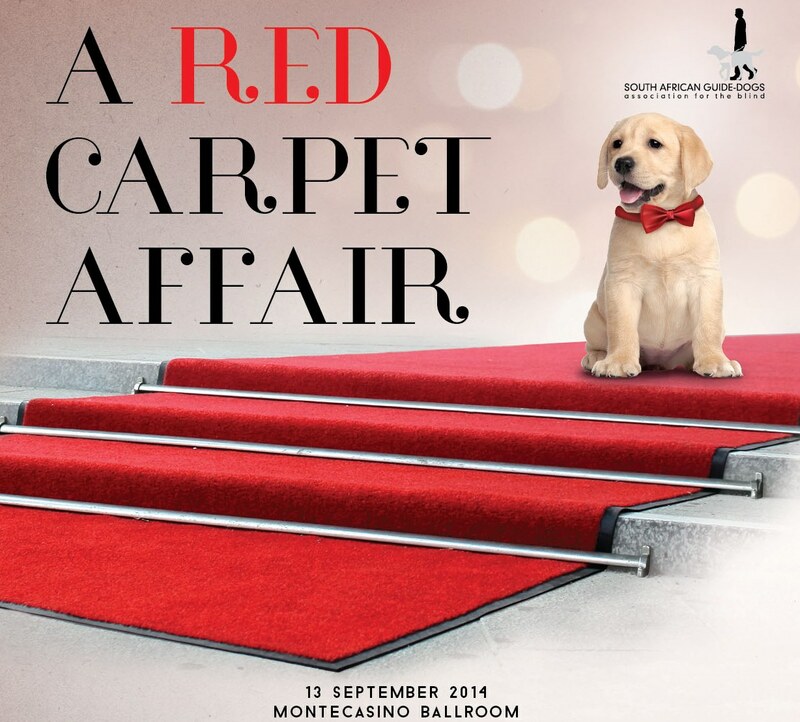 An @SAGuide_Dogs “Red Carpet Affair”! 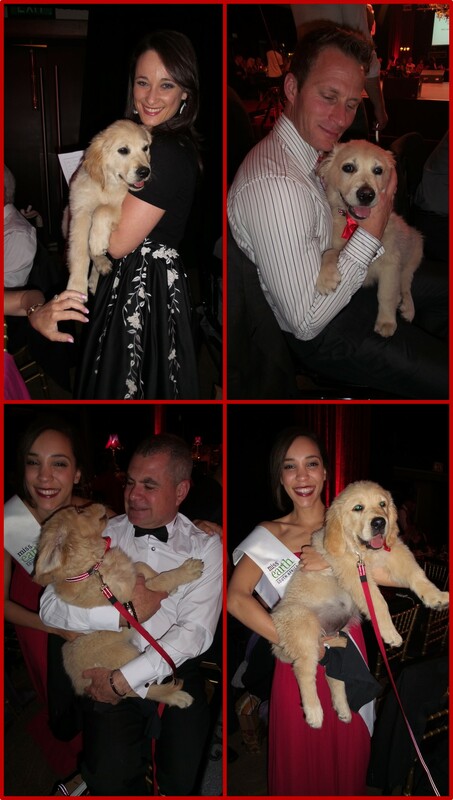 On Saturday night my Glugster and I were privileged to attend the SA Guide-dogs Association Gala Ball, which this year was billed as a Red Carpet Affair. I was quite chuffed with how my make up turned out for the evening, and the guests were photographed as they arrived so I can’t wait to get that picture too! 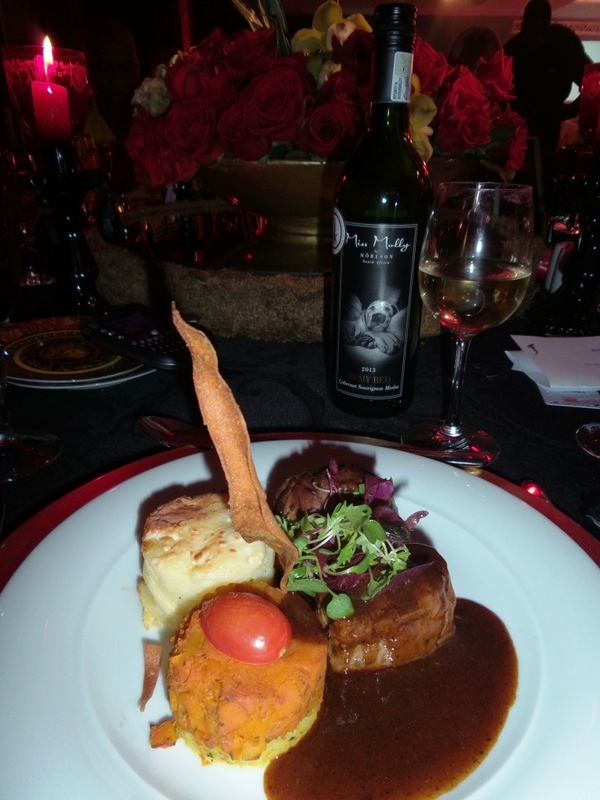 The annual ball, which took place in the donated space of Montecasino‘s ballroom for the 8th year in a row, is one the biggest fundraisers for the association as well as one of the country’s premier charity events. By popular demand, and due to her incredible passion for the cause, Ashley Hayden was once again the patron for the ball, and several artists performed throughout the night including two of the Goliath and Goliath comedians and Guide Dog Owner DJ Darkness with his Guide Dog Dolce standing patiently behind him, occasionally wagging his tail in time to the music! As an added bonus, you can listen to his set from the ball on SoundCloud! The hall looked amazing, it was like stepping into luxury. 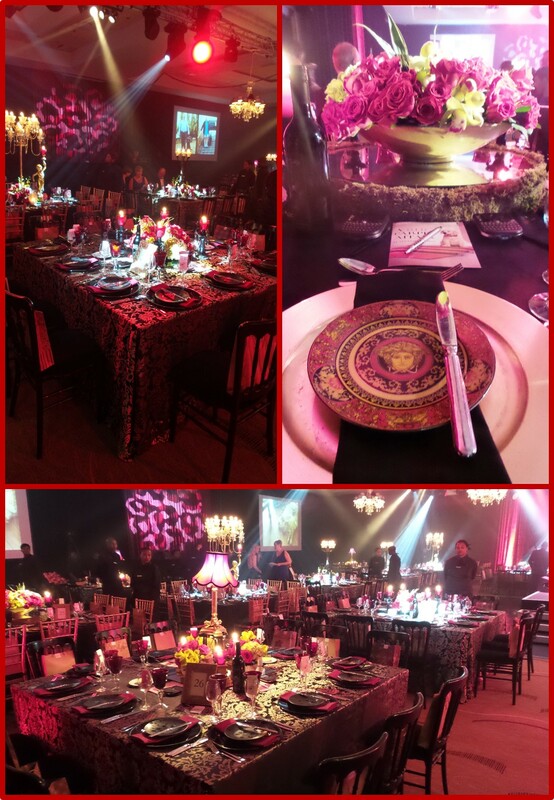 The tables were arranged with the stage in the centre, so no-one felt like they were sitting in the back and everyone could see the performers and the screens along the walls. The performers had a bit of a challenge though – having to turn around during their presentations to be able to see everyone. 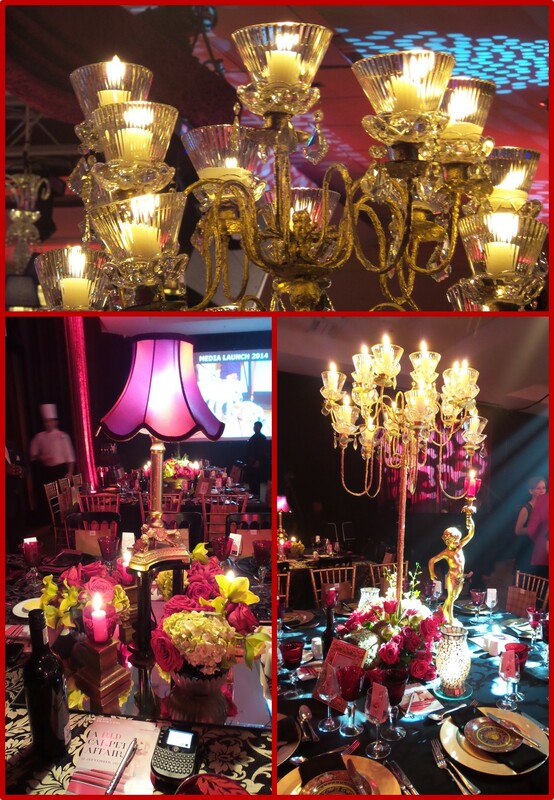 Rich red and gold centre pieces, hanging chandeliers, masses of flowers and gilt edged plates transported the guests far away from their every day lives and spoilt them with incredible food and entertainment. My mouth is watering just thinking about the incredible meal we had! Early in the evening the now traditional auction began – this year with a non-traditional twist. The donated auction lots were things like a night at the Palazzo Hotel, an oil painting on canvas by Guide Dogs’ own Gail Glover, wine from Moreson’s Mss Molly range, furniture and jewellery and each guest was given a plastic card (like a credit card) with their name on it. There were several Lumi Bidding Handsets on each table and the bidding was done electronically and quietly, with the handset alerting you if someone outbid you, and the items with their newest bids were displayed on a big screen. It was fantastic! It allowed far more time for entertainment and mingling and it was less intimidating than an auctioneer asking for bids. And then there were puppies! Finalists from the Miss Earth SA Pageant walked around the hall with the Golden Retriever puppies from the GDA’s “B” litter, collecting pledges for donations and sponsorships from the guests. 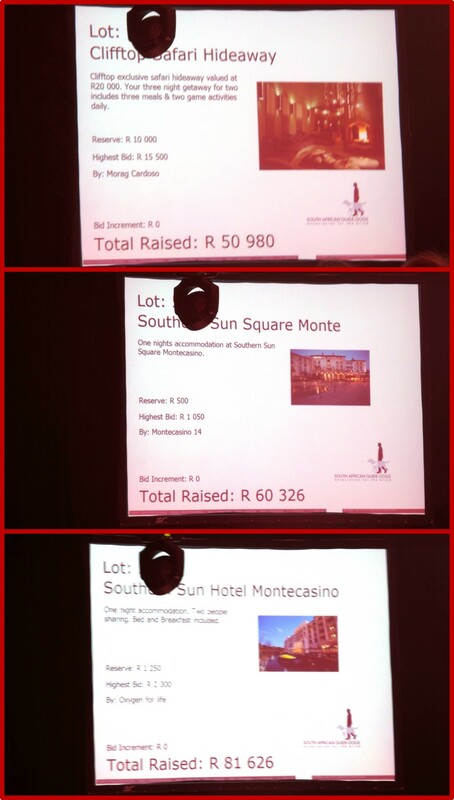 Bryanston Veterinary Hospital donated R40K, Supa Quik gave R80K, and Montecasino pledged a whopping R150K! My Glugs and I left at midnight after a thoroughly enjoyable evening, and the SA Guide-dogs Association managed to raise a little over R640K. I’m sure I’ve made you green with envy, so be sure not to miss next year’s ball! You Must See @showtime_sa’s @cirque_eloize! I’m usually terrible at recognising faces, but as the auditorium started filling up I saw SO MANY FAMOUS FACES! I was really glad when the show started and the lights went down and I could stop playing lookee-loo! And now onto the show. I’d seen a snippet on YouTube, so I knew it was nothing I’d ever seen before, but it went WAAAY beyond incredible. My hands were literally sore from clapping when we left! Could you imagine a contortionist and a break dancer dancing together!? It so worked! Guys on a pole, trampolining on and off a wall, a juggler, a guy on a stunt bicycle, a girl in a hoop… It was mesmerising! The show has beauty and artistry for the ladies in the audience, and it has the absolute cool factor for the men! Cirque Éloize’s dazzling and energetic show entitled “iD” started in South Africa for the very first time at the Teatro at Montecasino on Tuesday, 19 August. Showtime Management, SA promoters of this unique visual spectacular that combines contemporary circus arts and urban dance announced the show is extending by a week to accommodate public demand. “iD” must close on 14 September. With a limited season of only four weeks, patrons are encouraged to book now to avoid disappointment. Tuesday, Wednesday and Thursday 8pm performances ONLY. Available after 2pm on the day of the performance. Part-time and full-time students, including visiting international students. Student must be present with their student card. One show ticket only per valid card that must have a recognisable original photograph. 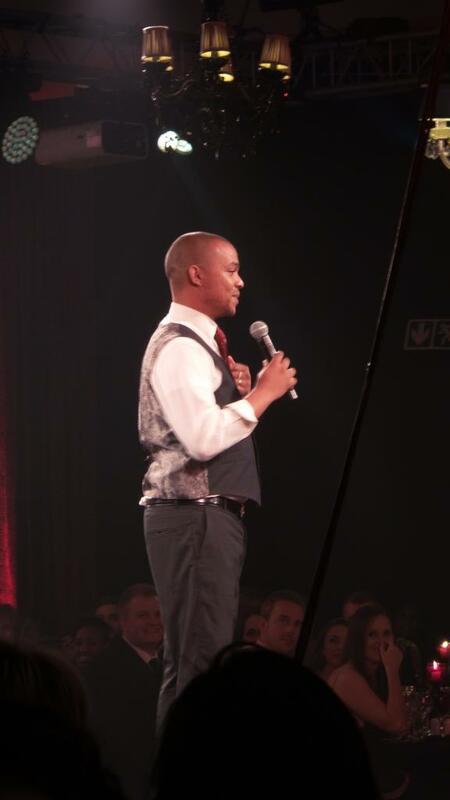 Only available at the Teatro/Montecasino Box Office. Computicket by calling 0861 915 8000 / 011 340 8000, visit www.computicket.com or visit your nearest Computicket service centre.